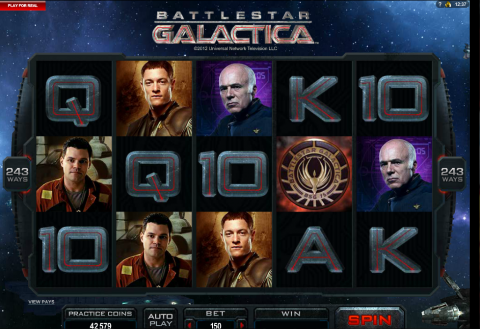 The Battlestar Galactica slot from MicroGaming is based around the popular TV series of the same name that first appeared in the 1970’s. This was remade in 2004 featuring stunning special effects and an engaging story. This 5 reel, 243 ways video slot features many of the main characters in the game including Starbuck, Appollo, Baltar and Six. The game has a good mix of randomly appearing features and scatter-activated bonus rounds. In this review I explore this slot in depth. First below you will find an overview of the basics of the game and the symbols you’ll want to appear on your reels. I then move onto examine the bonus features and how these are activated. I finish with an overview of the Battlestar Galactica slot and I also recommend a casino where you’ll be able to enjoy the game online with the help of some upfront free cash (no deposit or credit card needed). This slot is a 5 reel slot with 243 win lines. Instead of specific lines, all combinations starting from the left hand reel in any position count. This makes play easier to follow after a few spins to get used to the setup. If you have a symbol on each of the 5 reels, you know you hit the max prize for that symbol - and did not miss the win-line like you can with some 25 or 30 line slot games. There is an auto play feature, which is customizable based upon either the number of spins or a certain winning amount. The best standard symbols in the game are Starbuck and Appollo who are worth 2,000 coins apiece if you hit 5 symbols. Baltar and Six are worth 1,500, Colonel Tigh and Helo are worth 1,000 and finally Ellen and Tyrol are worth 500. You’ll also find the 9, 10, J, Q, K and A symbols in the game. The Battlestar Galactica symbol is the ‘wild’ one in the game and is stacked on reel one – this is also worth 3,000 coins for hitting 5. The other symbol is the fleet ship which acts as the scatter symbol in the game – hitting 3, 4 or 5 of these will activate the bonus round. There are two random features in the game that can be triggered at any time. Firstly there is the ‘Ion Storm’ feature which will turn at least one whole reel wild – although it can potentially turn up to 5 reels wild (which would be nice!). The other random feature is the ‘Run’ feature. When this activates, all wins will pay from right to left as well as the standard left to right. If you hit any of the ‘playing card’ symbols on the middle reel will also turn these wild – giving you more chance of gaining a win. During the ‘Run’ feature, Fight Mode can be activated. Here random symbols will be turned wild at any time and these wild symbols can be split into two, giving even more wins. However the best feature of the game comes when hitting the scatter symbol three times. Here you’ll gain 15 free spins, with the great added advantage of these wins all being multiplied by three, making this bonus round highly profitable if you run well. Alongside the bonus features, you’ll also be able to unlock video content as you go along. This is achieved by increasing your rank within the game, which you’ll do the more you play the game. This is a great looking slot, with some nice special effects when hitting the random features. Fans of the series itself will especially enjoy linking up with the characters of the show again, and unlocking the video content. The game is a solid one as far as slots are concerned, however there are slots out there with a greater range of bonus features which may hold your interest for longer. This is a game I will be returning too for sure. MicroGaming's Viper software platform (which is available at 32Red), allows this game to be played on phones and tablets via responsive browser technology. You will also find an old-school download. You’ll be able to enjoy this slot at the 32 Red Casino. This popular online casino enjoys a great reputation within the industry and has been the recipient of many awards over the years. You’ll also find a great number of other impressive slots alongside many of the traditional casino favourites like roulette and blackjack. When signing up as a new user at the 32 Red casino, you’ll be awarded a £10 no deposit bonus where you can try a range of games for free. You’ll also be able to take advantage of an offer where you’ll gain a £32 bonus for every £10 deposited. Check out BattleStar Galactica (and 100's of other new generation video slots) at the award winning www.32red.com now!